While Dabang Delhi K.C. never trailed in points, Jaipur Pink Panthers played out a match that kept the visitors in check in a fierce encounter that saw the game end in a 37-37 tie at the Tau Devilal Sports Complex in Panchkula on Thursday. Chandran Ranjit and Selvamani K bagged a Super 10 each keeping their respective teams' score ticking while Sandeep Kumar Dhull recorded a High 5 with six points, countered by Anil Kumar's four for Dabang Delhi K.C. Pawan Kadian came close to a Super 10 of his own, falling just one short. Dabang Delhi K.C. hit the ground running scoring the match's first five points with an all-round show. 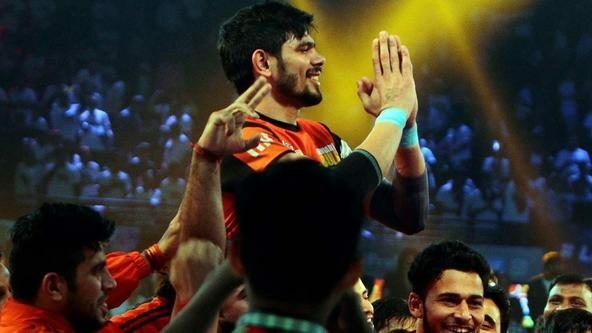 Jaipur Pink Panthers opened their account in the fifth minute with a Dhull-Super Tackle on Meraj Sheykh, which was followed by a couple of successful raids from Deepak Niwas Hooda. Dhull then got his second Super Tackle when he bagged Sheykh again to level the score at six each. But then Ranjit crucially got Hooda with a perfectly-executed reverse kick and then a few minutes later wrapped up the last two men on the mat with a four-point raid that inflicted the first All Out on Jaipur Pink Panthers with the score at 11-7 in favour of the visitors. At the reset, the lead increased to five but substitute Selvamani made an immediate impact with a Super Raid bringing the deficit down to two at 12-10. 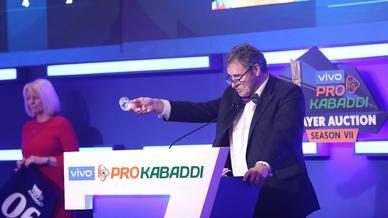 Dabang Delhi K.C., however, held their fort and when Kadian got a two-point raid, Jaipur Pink Panthers' lead shot up to five points again at 16-11. 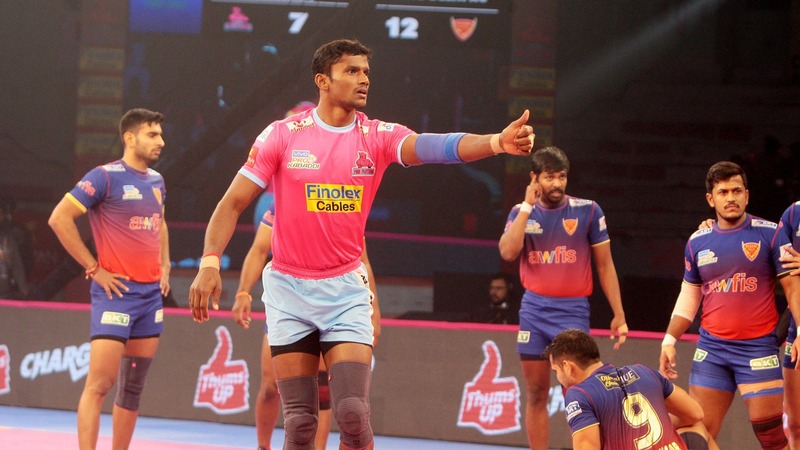 Selvamani continued to score for Jaipur Pink Panthers as the two sides traded points, with his successful raid on Ranjit proving crucial. Dhull then fired another Super Tackle on Sheykh, completing his High 5 with all his points coming through the Iranian, to bring the deficit down to three. 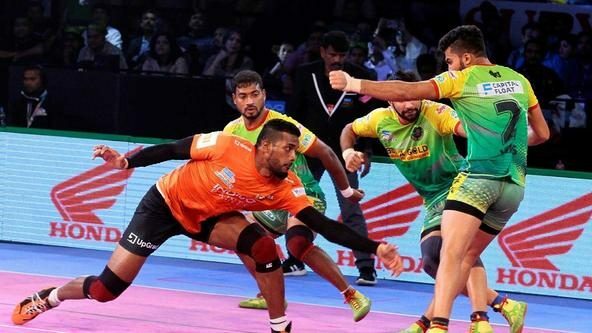 Ajinkya Pawar then stepped up for Jaipur Pink Panthers by getting three points in his next two raids to get things level, with the halftime score reading 18-17 in the visiting team's favour. With Dabang Delhi K.C. down to only one man, Kadian delivered a Super Raid under pressure when the second half began. Ranjit then added to the spree with two straight successful raids that bore him three points and completed his Super 10. With the deficit to Dabang Delhi K.C. scaling up to six, Selvamani produced a four-point Super Raid to complete his own Super 10 and get the scores to 24-22. The two teams then exchanged points with Dabang Delhi K.C. 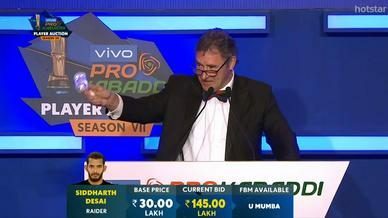 riding on Sheykh's raids before a Vishal Super Tackle on Hooda gave the visitors a five-point lead at 29-24. Sheykh added a couple more to his tally and his team's lead soon extended to seven at 32-25. The oscillating battle continued when Ranjit ran into the lobby awarding a Super Tackle to the opposition. Pawar then grabbed a two-point raid and Sheykh was tackled to bring the difference to two points. Another Super Tackle, this time on Pawar, swung the momentum in Dabang Delhi K.C. 's way with Jaipur Pink Panthers soon succumbing to an All Out with the scores at 36-35 and just under two minutes left on the clock. 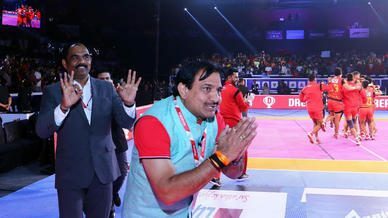 The final minutes were intense as Hooda levelled the scores at 36-all and then Ranjit upped it to 37 with a bonus before being tackled, the intensity finally culminating into a tie as the two teams settled in what was the final match for Jaipur Pink Panthers at home.